Yeah you all knew this day was coming. I actually developed my list of bands at the very start of MoFo, so I have been holding out on you all with this one. HOW COULD I NOT FEATURE SALT N PEPA?!? 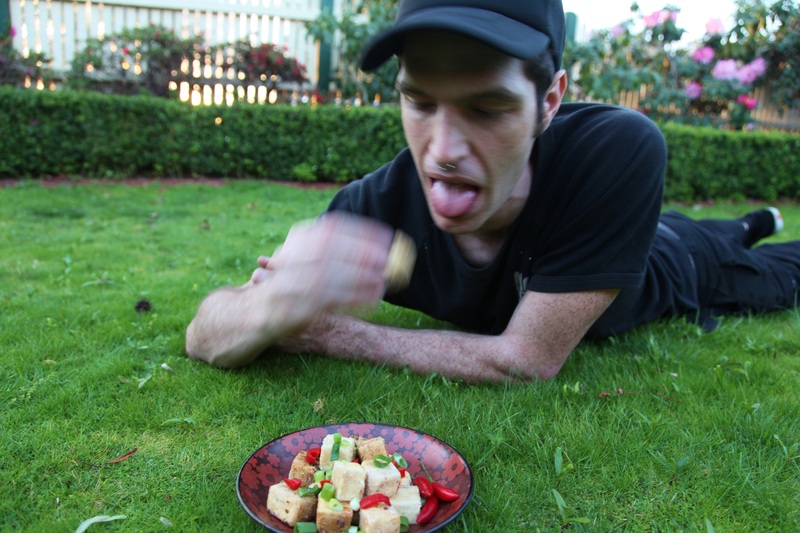 I wasn’t particularly creative in what I would make for this one – I always intended to do salt and pepper tofu. I probably should have created more of a challenge, but hey, this is delicious (and it is too late in the month for big challenges). Plus, I have never had super great luck with it – I’ve only attempted it twice before and neither time I got it quite right (or I made a big mess of the ‘cubes’). So I’m pretty happy with this, and happy with my return to the grass backdrop. It reminds me of the pictures I took while we were living in the van, where the ground was our table. Haha. Anyway, doesn’t it just highlight the green spring onions so beautifully?! 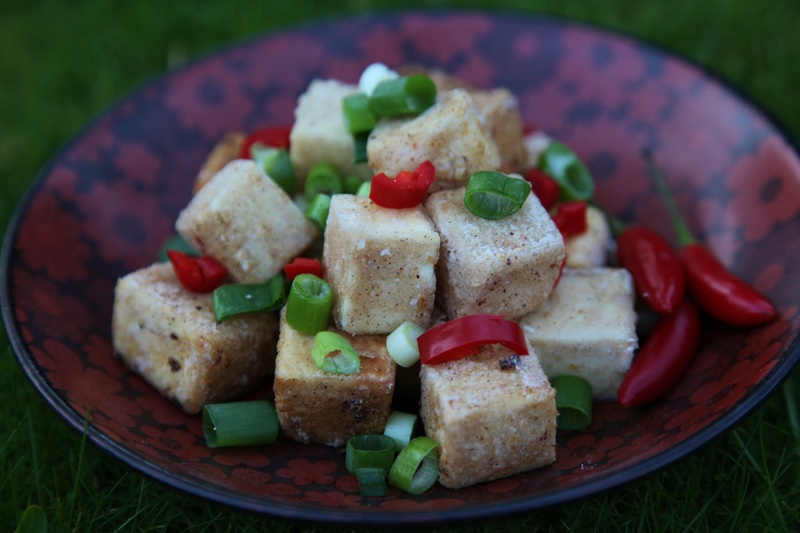 Drain your tofu, and handling it carefully, cut it into cubes. Mix cornflour, salt, pepper and chili on a plate. Dredge each piece of tofu through the cornflour mix, ensuring each side gets covered. Heat coconut oil until very hot. Depending on your tools and stuff, you might want to use a wok and one of those wire net thingos. I don’t have one, so I just used a small saucepan. 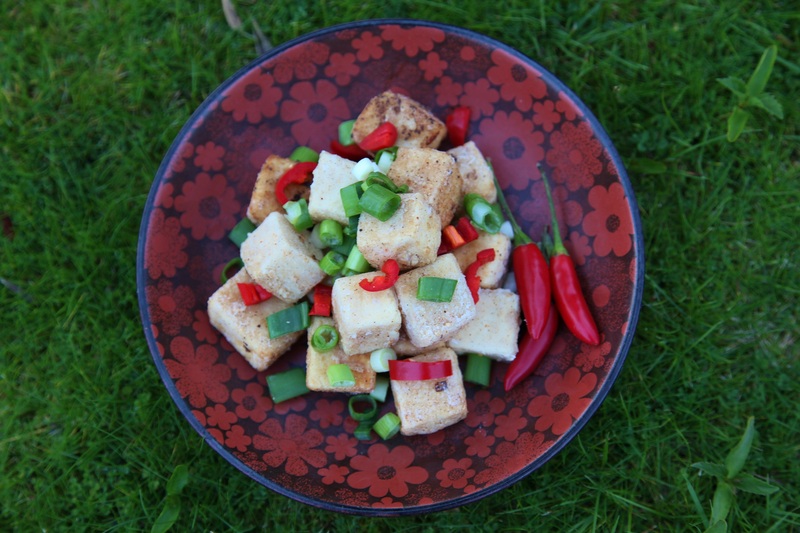 I put enough coconut oil in the pot that would cover half a piece of tofu – maybe about a centimetre and a half? (Sorry, didn’t measure the quantity of oil I used – just put it in). When the oil is very hot (you can test this by flicking a drop of water into it – it should sizzle and bubble rapidly), carefully place tofu into the oil, a couple of pieces at a time. Let it cook for a minute or so before carefully flipping it with a fork to cook the other half. Remove from oil once a slightly golden crust has formed – drain on paper towel. Chop up spring onion and chili to serve. These did not last long with the (cleanly shaven) Bear around. I literally got like three of them. Look how fast his hand is moving to his face! It’s just a blur! At least I know they got the seal of approval. How does one choose just one Salt N Pepa song to play? Yeah, gonna go with this one…so ’80s cool. I don’t know where I would be without my beloved ‘fu. Isn’t it funky?! You can’t help but dance to this one. 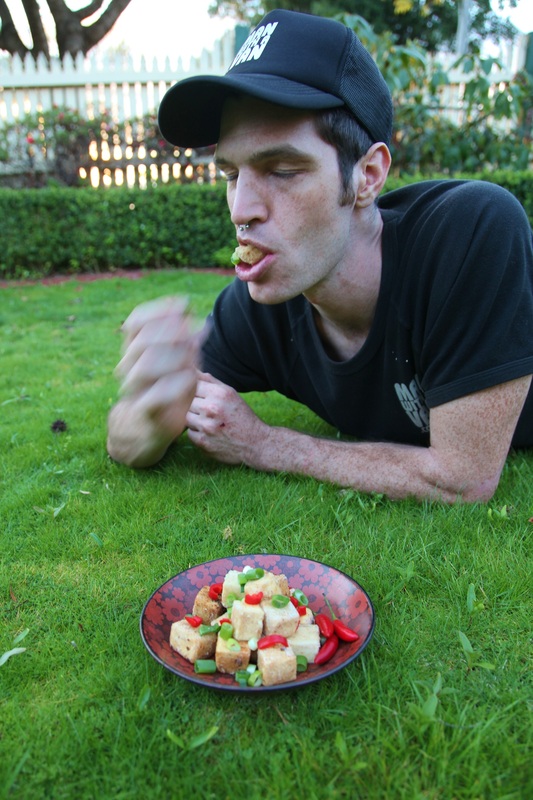 Agreed, long live tofu! My friend and I were singing and dancing to this at work a few weeks ago. So much classic Salt n Pepa to choose from! Speaking of Push It, have you seen this greatest car ad of all time? I had seen the Grandmaster Flash one on TV, but somehow missed this one completely! Thankfully I had a friend to tell me about it and the internet to fill in this blank. I love the looks and gestures she is making to people from the window. Me too – the gestures are the BEST! 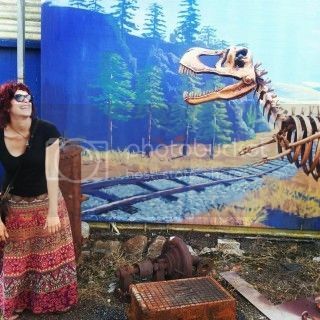 Aaaah I love this! I love the group, I love the song, I love Salt and Pepper Tofu. I love salt and pepper seitan. 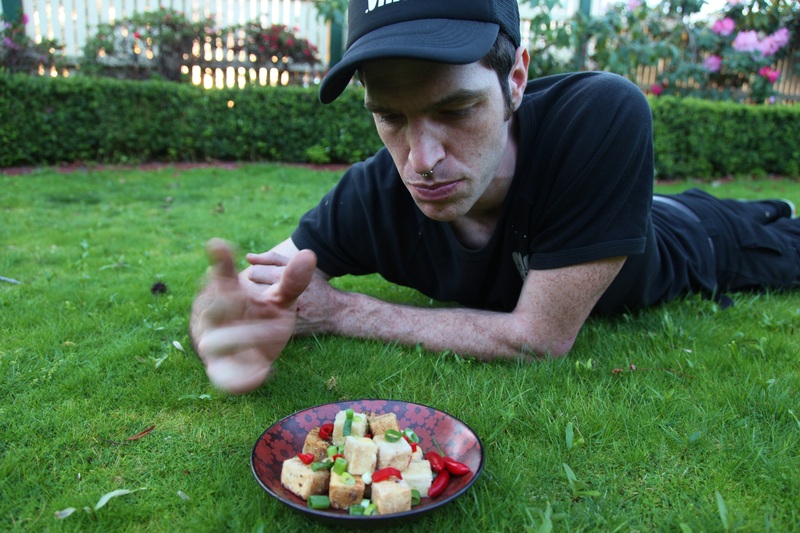 I should make it with tofu some time. Ooh I’ve never thought to do it with seitan. I love the silky fall apart middle of these ones, but I imagine the chewy seitan would be a whole new experience! Haha, it’s the quick or the hungry around here! Great music, great food, great choice! When I was in DC a few months ago, I came across buskers rapping Shoop with just an electric violin as backing. Super cool. Thanks Cindy! That rendition sounds incredible. Salt N Pepa are so cool…the ’90s were great. I agree and the last few of my efforts were probably more on the ‘really bad’ side. But third time lucky! I just love the combination of crispy and silky, it’s so nice. Ha! It was lucky I even snapped him at the rate he was eating! What?! 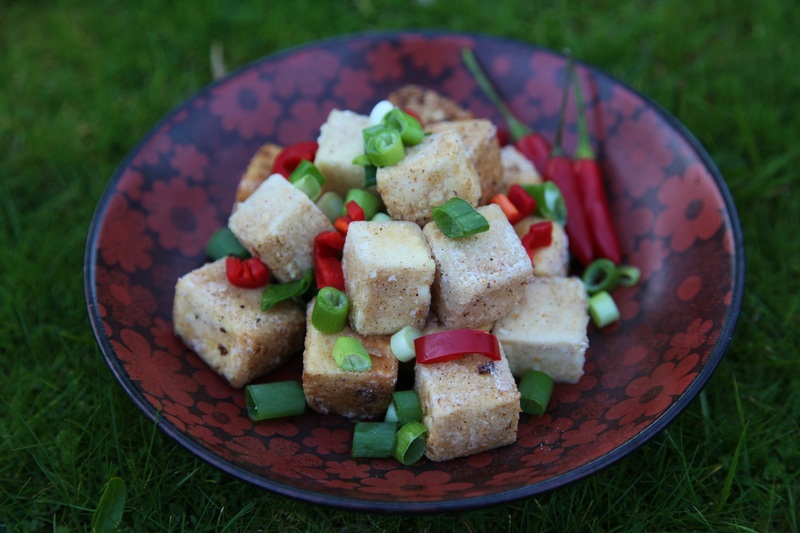 Salt n PEPA….I love salt and pepper tofu, it’s one of my favorite seasoning for fried tofu and white pepper is my favorite peppercorn! I use it in almost every Asian dishes! I love white pepper too, I don’t think I use it nearly enough though. I will have to look to you for some inspiration!